Chodat Fitness coaches provide Illawarra’s leading coaching programs and sessions. These sessions improve the athletes speed, acceleration, power and technique for athletic distances and ball sports. All our sprint coaches are ex-athletes that have had many years of experience in sprinting, ball sports or athletic backgrounds. Having competed as children all the way through to senior ranks, they will be able to give you child the competitive edge both physically and mentally. These classes are designed for children of school age and held on the synthetic athletics track at Beaton Park Leisure Centre. They run for 1 hour 15 minutes. The classes enable children to build confidence and encourage healthy competition where they can benefit from training together under the guidance of their coaches advice. In our sessions, children, apart from the specialist training and programming, will be learning how to manage event preparation, harness their skills and let their talent shine. Children are to meet near the finish line on the track before the class starts. One on one personal trainingfor athletes in this field is also available. Additional Information; Children are to pay a track entry fee (at the Beaton Park Leisure Centre front desk) before each class, usage cards are also available at the centre, enquire at the front desk. 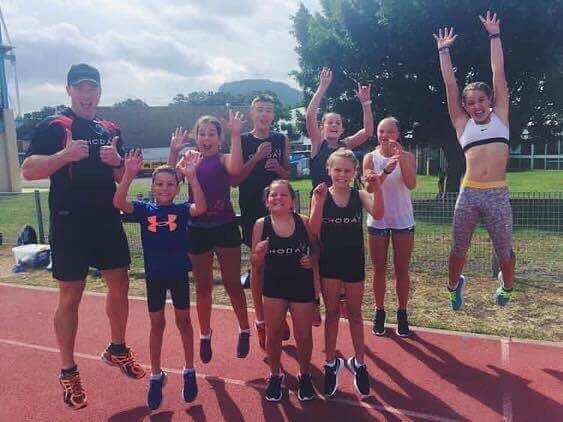 Sign up for athletics coaching in Wollongong today! Get the coaching and support you need to succeed with Chodat Fitness! For any enquiries, please call us on 0431 383 411.